This NYC style deli may have moved to share the Bacci Pizzeria place down the street but they're still serving up the same sandwiches as before. 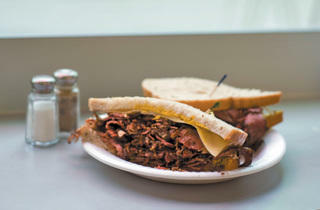 The long lunchtime waits are rewarded with deli classics, like egg salad sandwiches; hot, juicy pastrami; and “Perry’s Favorite”—corned beef, Jack cheese, coleslaw and Russian dressing piled high on fresh rye. Earlier hours offer breakfast takes on similar classics, including the Mad Moscow, a mess of eggs scrambled with pastrami, corned beef and Russian dressing, piled onto a toasted bagel. El stop: Brown, Orange, Pink, Purple (rush hrs) to Washington, Blue, Brown, Green, Orange, Pink, Purple (rush hrs) to Clark/Lake. Bus: 134. Huge sandwiches, never had so huge in my life! 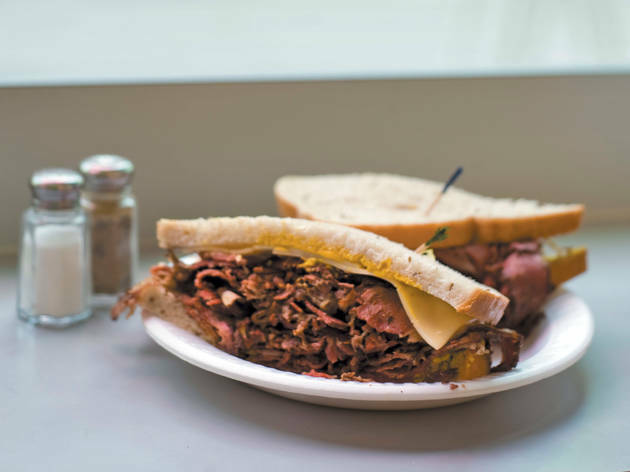 This great Loop lunch spot offers high-quality deli sandwiches the size of your head—eat half at lunch and take the other half home for dinner. And seriously, if your phone rings while you're there, don't take the call.